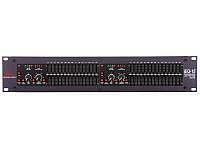 DBX iEQ-15 Dual 15-Band Graphic EQ with AFS, With an EQ heritage that has produced countless industry standard patents and dates back more than 30 years, the dbx iEQ-31 easily lives up to the dbx legacy of uncompromised sonic integrity. In addition to unsurpassed equalization specs, the iEQ-15 also offers the built-in necessities which include AFS feedback Suppression, Type V noise reduction and PeakStopPlus® limiting. Besides including two 15-band channels of 2/3-octave equalization, the iEQ-15 also offers +12 dB input gain range; switchable +6 or +15 dB boost/cut range, 40mm faders, XLR, 1/4'' and Euroblock inputs and outputs, nonconductive nylon sliders; and an intuitive user interface with comprehensive output and gain reduction metering. As always, the inevitable result of our meticulous attention to detail and top-quality componentry is exceptional sound, performance, and reliability. The iEQ series represents a major step forward in the performance of EQs. The iEQ series is now able to offer state-of-the-art digital EQ performance and specs with an analog look and feel. From its amazing 10Hz to 22kHz frequency response, to its 113dB dynamic range and Advanced Feedback Suppression (AFS), dbx proprietary Type V noise reduction and PeakStopPlus® limiting, the iEQ-15 offers out of this world specifications with a downto- earth price point. 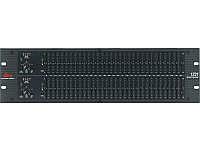 Sure to find a home in the studio, on tour and with installed sound venues, the iEQ-15 is destined to take its rightful place in the lineage of great dbx signal processors that are the professional’s choice in signal processing. With such pristine design and quality, the iEQ-15 offers the maximum sonic flexibility in a straight forward interface and rock-solid construction.